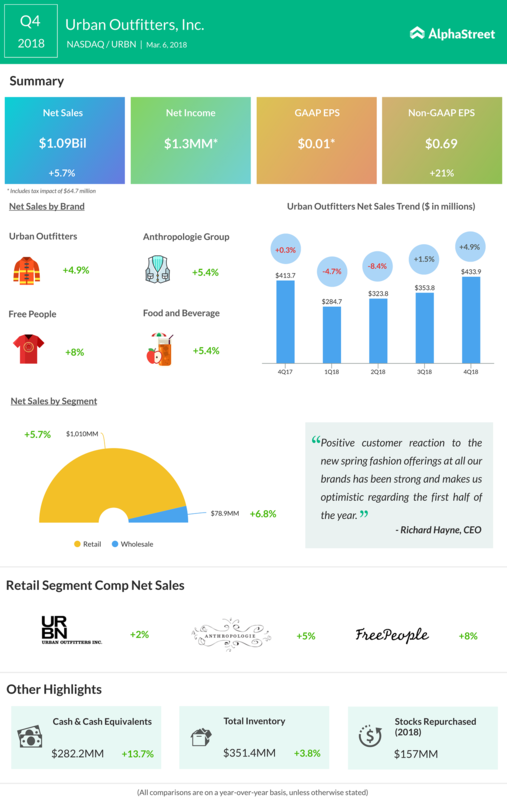 Apparel retailer Urban Outfitters (URBN) reported better than expected pre-tax profit in the fourth quarter, aided by strong holiday sales. However, unadjusted earnings took a beating from tax-related charges and fell sharply. While the stock witnessed some weakness in the after-hours following the announcement, it bounced back when markets opened on Wednesday and gained further momentum during the morning session before hitting a multi-year high ($38.28). Earnings, excluding one-time charges, climbed 21% to $0.69 per share, surpassing the Street’s estimates. Taking a hit from charges related to the recent federal tax law, reported earnings plunged to an insignificant one cent from 55 cents last year. At $1.09 billion, sales were about 6% higher compared to the year-ago quarter, and the growth rate was a tad higher than analysts’ prophecy. The top-line benefited from the generally upbeat holiday season. Conforming to the latest trend in the retail space, comparable store sales of Urban Outfitters’ digital retail segment registered double-digit growth, with contributions from all the three major brands. Of late, the rival of Abercrombie & Fitch (ANF) has been taking measures to strengthen its digital platform by broadening the collection of brands. Meanwhile, retail stores witnessed a year-over-over year decline in comparable sales, limiting the overall growth to 4%. There was a 6.3% annual growth in wholesale sales during the fourth quarter, with most of the sales coming from the popular Free People brand. “We are particularly pleased with how well the brands transitioned in January. Positive customer reaction to the new spring fashion offerings at all our brands has been strong and makes us optimistic regarding the first half of the year,” said CEO Richard Hayne. Urban Outfitters had ventured into the casual dining arena by acquiring Vetri Family restaurant group a couple of years ago as part of its efforts to overcome the sprouting challenges faced by the apparel retail sector.